After his mother died in childbirth and his father abandoned him as a newborn, Emmanuel was raised by a well-wisher, who later took him to Sons of Manaseh Children’s Home so that he could go to school. In his original home with the Maasai community, Emmanuel was expected to become a herder, like the rest of the young men of the tribe. Instead, he found a new family of many brothers and sisters in the children at Sons of Manaseh, and another future in getting his education. Emmanuel has fit right in at the children’s home. He loves playing soccer; he collects soccer balls, and is always ready to start a game by making a ball out of wadded-up clothes. 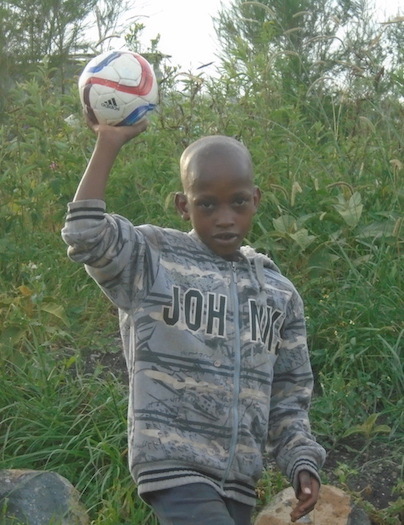 Emmanuel has even earned the nickname “Football Champion” from his friends at the children’s home. Emmanuel is currently in class 5, and very well understands the need to work hard in school. He needs to stay in school to be able to make a life for himself. He also needs moral support to keep him motivated to continue succeeding. Consider sponsoring Emmanuel’s bright future today! Sponsoring Emmanuel’s primary education is $50 per month. Thank you for sponsoring Just One.